With Mother’s Day on Sunday there’s one mother you don’t want to forget to acknowledge: your teenage mother. I’m talking about Mary, the mother of Jesus. I was hesitant to write about her because, to be frank, when I think of Mary I get the stereotypical images of Mary with her regal blue or pink robe cooped up in some unrealistic palace, bedecked with a crown of jewels. Those kinds of depictions may say something about our reverence for her or the importance of her place in salvation history, but they don’t quite do it for me. The truth is, when the angel Gabriel came to her to announce that she will bear in her womb the author of life, she was a simple teenager and was when she married Joseph. There’s no doubt about it: She was a teen mom (or as I would say, a teen mum). And certainly motherhood and marriage in one’s teenage years was not uncommon then. She lived in the unknown town of Bethlehem in simple conditions. There was no palace. There were no jewels or fancy garments. 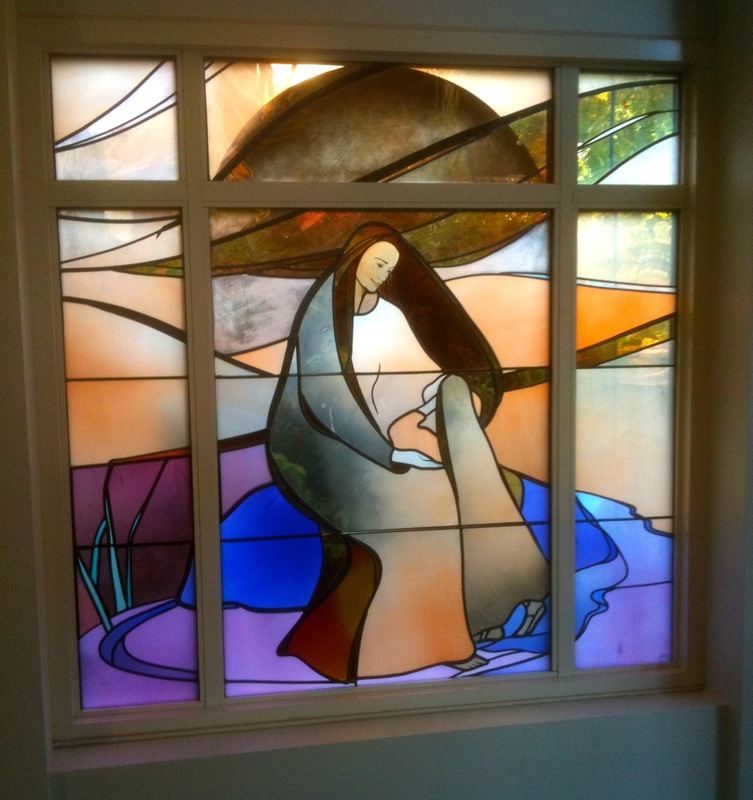 In the Regis University chapel in Denver, CO there is a simple yet beautiful painting of the annunciation scene. Mary has the typical colours, but over her simple pink top is a simple blue dress with a red cloth tied around her waist. 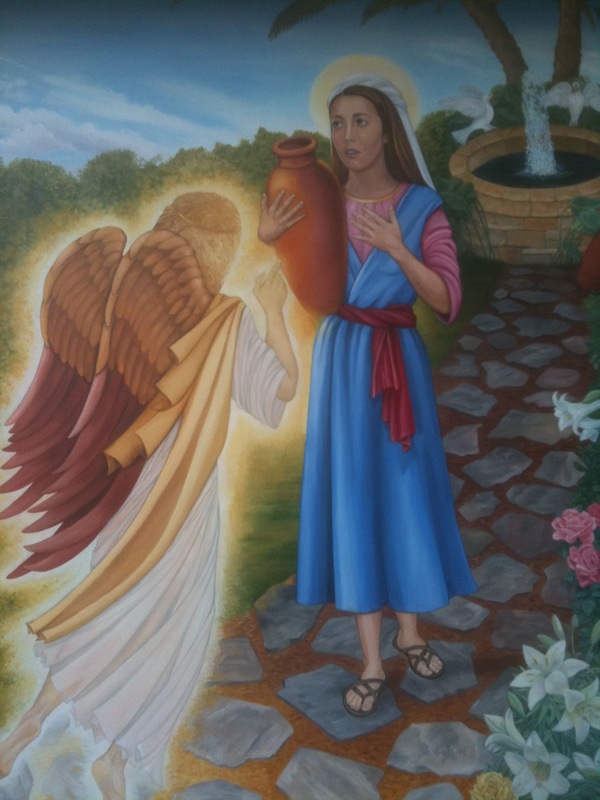 She looks like a peasant girl, holding a large urn of water which she just retrieved from the well behind her. But not more than a few steps from the well she encounters a glowing winged angel. Hand to her chest, Mary looks breathless and caught off-guard. Her expression seems to say, “Who me?” The angel points toward her affirmingly. Images like this hint at the true Mary, the one who became a teenage mother whether she was ready or not. Mary probably turned to her own mother, Anne, for mothering counsel. In the chapel of St Ignatius High School in Cleveland, OH there is another depiction of Mary but this time she’s shown as a small child. 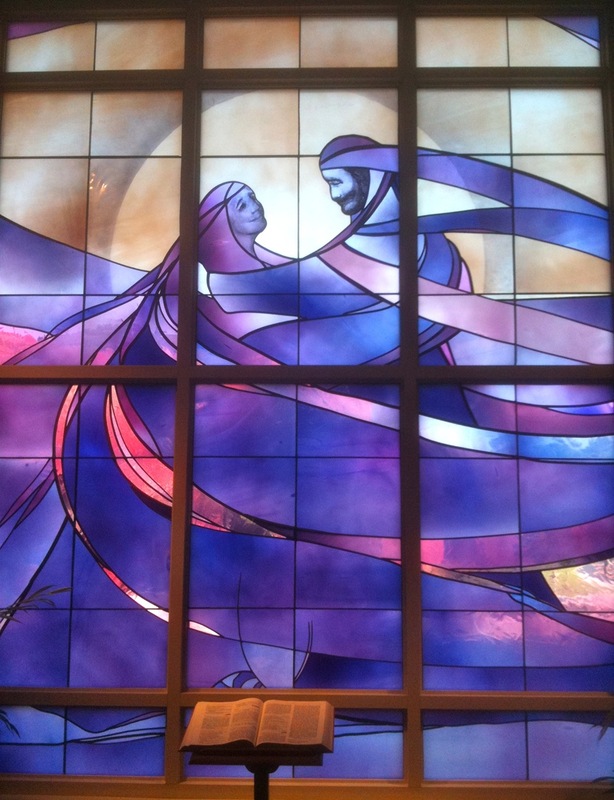 The stained glass image shows her at the foot of her seated mother. Mary’s standing but leaned toward her mother’s knees, one of her feet on tiptoes, hands on her chin, arms resting on Anne’s lap. Anne looks down lovingly to her daughter with a smile. Perhaps Mary imagined a scene like this as she pondered her own motherhood. Mother’s Day is a unique opportunity for mothers to reflect on their own experience being a daughter. There is only so much a parent can learn from books. Often the past gives more insight into the now—what to do, what not to do. Our own mothers (or mother figures) have a lot to tell. The stained glass image of Anne and Mary does too, even in their still silent embrace. We know from scripture the kind of mother Mary was to Jesus. She was with him from beginning to end. She was with him escaping to Egypt by night to save his life from Herod’s henchmen. She taught him about the faith and watched him grow up through boyhood. There was no break in Mary’s love and compassion for Jesus. There was no doubt she was a strong woman. And as Jesus was physically pierced on the cross, his mother’s heart was pierced with sorrow. Saint Ignatius says that when Jesus rose from the dead the first person he most likely visited was his mother. Wouldn’t you? In fact, Ignatius’ Spiritual Exercises contain a meditation on this very meeting. Imagine the scene and the kind of embrace that was had. Another one of the St Ignatius High School chapel windows depicts this very scene. Jesus and Mary both have smiles on their faces—all you can really see are their faces. The rest of the scene is a whirl of colour, pinks and purples, wrapping them up in an embrace with each other. Tremendous joy. The kind after mother and son are reunited after eons. Mother’s Day should capture the spirit of Mary’s story with the narrative of our own. We all have different stories about our mothers, perhaps not as romanticised as Jesus, Mary, and Anne’s, but they’re real. Our stories inform our present and how we live it out, how we relate now to our own mothers and to our children. Mary gives us a beautiful example of a teenage girl thrown into a frightening and unknown situation, but who, by the grace of God, learns to love, to mother, and to give of herself fully to her God.